We are working through B&H’s Perspectives on Israel and the Church: 4 Views. See my introduction and other posts in this series. This post summarizes the responds to the Progressive Covenantalist viewpoint of Tom Pratt and Chad Brand. We are working through B&H’s Perspectives on Israel and the Church: 4 Views. See my introduction and other posts in this series. This post presents the Progressive Covenantalist viewpoint of Tom Pratt and Chad Brand. We are working through B&H’s Perspectives on Israel and the Church: 4 Views. See my introduction and other posts in this series. This post summarizes the responses to Robert Saucy’s Progressive Dispensational viewpoint. 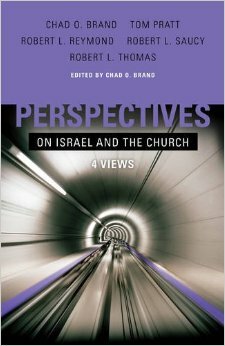 We are working through B&H’s Perspectives on Israel and the Church: 4 Views. See my introduction and other posts in this series. This post summarizes Robert Thomas’ chapter defending the Traditional Dispensational viewpoint. We are working through B&H’s Perspectives on Israel and the Church: 4 Views. See my introduction and other posts in this series. In my previous post we looked at Robert Thomas’ Dispensational view as to Israel and the church. In this post I will summarize the three responses to his essay. We are working through B&H’s Perspectives on Israel and the Church: 4 Views. See my introduction and other posts in this series.